With the cost going up by over 60 per cent, the 412 MW Rampur project being executed by the Satluj Jal Vidyut Nigam is no longer the most economical project. The cost of the project scheduled to be commissioned later this year has shot up from Rs 2,047 crore in 2006 to over Rs 3,100 crore, though the exact figure will be known when the SJVN files a petition for determination of tariff with the Central Electricity Regulatory Commission next month. Apple orchardists suffering large-scale damage due to the infestation of apple root borer have a reason to cheer with scientists of the Dr YS Parmar University of Horticulture and Forestry, Nauni, coming out with a biological method using fungus metarhizium anisoplae to control this fungal attack. The industrial policy, announced by the Punjab government yesterday in which incentives have been announced for the small and medium-scale industry like waiver on VAT and Excise duty, will pose a major challenge to the Industry Department of the state. Una has become the first district in the state to facilitate e-transfer of wages into bank accounts of workers employed under MGNREGA scheme. Deputy Commissioner Abhishek Jain, talking to The Tribune, said: "From June 1, we have e-transferred the wages of more than 60,000 workers employed under the MGNREGA scheme into their accounts. The temporary stop-gap arrangement of providing ultra-sound facility to patients at the Civil Hospital here has been stalled for the past three months causing a lot of hardship to patients. The radiologist of the hospital had been transferred to Nalagarh about a year back by the previous Dhumal government. Keeping in view the problem of thousands of patients visiting in the hospital from Nurpur, Jawali, Fatehpur, Indora and Bhatiyat Assembly segments, local MLA Ajay Mahajan had taken up the issue with the state government. To protect the state’s environment is the top priority of the Himachal Government. Brij Behari Lal Butail, Speaker, HP Assembly, on the eve of World Environment Day addresses a meeting in Palampur on Tuesday. Chief Minister Virbhadra Singh sees the third victory in a row in the Mandi bypoll. It has emerged as a straight fight between his wife Pratibha Singh, a third-timer, and the BJP’s Jai Ram Thakur, a four-time legislator from Seraj since 1998. Himachal Road Transport Corporation (HRTC) vice-chairman Kewal Singh Pathania, who is also Congress observer for the Bharmour tribal Assembly constituency, which is a part of the Mandi constituency, has asked party workers to highlight the Congress achievements among people. 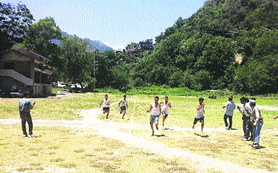 The hot scorching sun and frequent fires surrounding the valley could not discourage applicants and Forest Department officials from continuing with the physical efficiency test (PET), which is also the qualifying test for appearing in the written exam for the recruitment of forest guards (FGs) on contract basis. It finally ended last evening. Candidates take part in a physical test at the Police Ground in Chamba. Murder accused Sanjiv Kumar, an undertrial prisoner at the government sub-jail at Ragunathpura, near here, escaped from police custody when he was being escorted to the jail after his appearance at the Fast Track Court, Ghumarwin, last evening. President of the state Congress Sukhvinder Singh Sukhu has suggested changes in the implementation of the Skill Development Allowance scheme to cover those who have passed matric exams. The Himachal Pradesh Government has reconstituted the Temple Trust, Shri Luxmi Narayan Temple and Vyas Gufa, here and nominated 20 members, including six official members and 14 non-official members, from the town. The BJP has accused the ruling Congress of violating the poll code and filed a complaint with the Chief Electoral Officer regarding an advertisement highlighting the achievements of the government published in a vernacular daily today. Randhir Sharma, general secretary of the state BJP, today said the Congress had no issue for the Mandi byelection and Chief Minister Virbhadra Singh was misleading the public. Pankaj Gupta, Judicial Magistrate,1st Class, Indora, yesterday sentenced Sagar Singh of Sanor village to two months’ imprisonment and a fine of Rs 5,000 for duping four unemployed youths for recruiting them in the Army. Rakesh Kumar Walia, Special Judge, Sirmaur, today sentenced a senior planning draftsman in the office of the Town and Planning (TCP) Department, Nahan, to one-and-a-half-year rigorous imprisonment (RI) and a fine of Rs 5,000 for accepting bribe. With the cost going up by over 60 per cent, the 412 MW Rampur project being executed by the Satluj Jal Vidyut Nigam (SJVN) is no longer the most economical project. The cost of the project scheduled to be commissioned later this year has shot up from Rs 2,047 crore in 2006 to over Rs 3,100 crore, though the exact figure will be known when the SJVN files a petition for determination of tariff with the Central Electricity Regulatory Commission next month. Accordingly, the cost of generation will also go up from Rs 2.39 per unit to around Rs 4 per unit. The increase is high keeping in view the fact that it was virtually an extension of the country’s largest hydroelectric venture, the 1500 MW Nathpa Jhakri project. As such, it did not require any diversion dam and delisting chambers, two major and most costly components, besides the tunnel. When the agreement for assigning the project to the SJVN was finalised in July 2002, the cost was even lower at Rs 1,734 crore. However, the accord could not be signed as employees of the state electricity board had opposed it. The Congress government, which came to power subsequently, had renegotiated the terms and conditions and got its equity share raised from 25 to 30 per cent. The agreement was finally signed in October 2004. In the meantime, the cost of the project had escalated from Rs 1,734 crore to Rs 2,047 crore. With the cost of generation originally pegged at Rs 4.97 crore per megawatt, it was the most economical project. However, the revised cost is touching Rs 8 crore per megawatt. Engineers of the SJVN partly blame the bad geological strata in the tunnel along with price escalation for the huge cost overrun. The quantum of problematic strata was estimated at 35 per cent but it turned out to be 58 per cent. The price escalation and hike in wages due to grant of 25 per cent hydro allowance to the staff increased the cost by Rs 400 crore to Rs 500 crore. They also point out that the diversion of the entire discharge from the tail race of the Nathpa Jhakri project from left bank to the right bank of the Sutlej through a tunnel underneath the riverbed also added to the cost. The project will generate 1,770 million units of electricity annually. The tail race discharge will be taken through a 15-km-long head race tunnel of 10.5 m diameter to Bayal where the powerhouse was being constructed. The powerhouse will have six turbines of 68.67 MW capacity each, like the Nathpa Jhakri project, as the two projects will function in tandem. In recent years more than 80 per cent orchards lying in Chopal and Rohru areas of Shimla district have been facing the attack of this pest and the extent of manifestation was as much as 100 per cent in some cases. This had forced orchardists to resort to extreme measures like uprooting their 10-15-year-old orchards. Even two-three-year-old plantations have been facing this pest attack, thus making it the most severe pest attack in recent years. The rising temperatures fuel attack of apple root borer, especially in orchards located in low and mid-hills at elevations ranging between 4,500-6,000 ft and the infestation is acute in sandy soil with warm climate. A team of scientists, comprising Dr Usha Chauhan and Dr PL Sharma, who have been working with the Department of Entomology for the last two years have helped devise this biological control method to contain the fungus. Trials were conducted in Chopal, Rohru and Kotkhai areas of Shimla district where various bio-agents like fungus entompathogenic nematodes, along with other recommended pesticides like durmet, were used. “This fungus controls larvae of apple root borer disease by more than 80 per cent when applied at the basin of plants in July and August when there is rainfall,” they said. The scientists suggested that further attack could be prevented by collecting adult beetles of this pest in the presence of adequate light during in June and July on a mass basis and killing those. The extent of damage each beetle could cause could be gauged from the fact that each female adult beetle laid 300 eggs in a life span of 50 days. Since 2003, when the industrial package was announced for Himachal, a large number of small and medium units had shifted to the state from Punjab. The units had five-year waiver in excise duty and income tax from the date of commissioning. Besides there were many other incentives. The package was initially announced for 10 years. However, Punjab and Haryana protested against the industrial package to Himachal on the plea that it was leading to flight of the industry from their states. 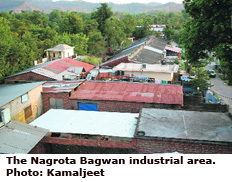 The major component of the industrial package was withdrawn by the UPA government in 2010. The other facilities such as capital subsidy also finished on January 6, 2013. Now without any special incentive, the Industries Department would have to compete with Punjab and Haryana for attracting investment to the state. With Punjab announcing major incentives as waiver in Central Excise and VAT, the Himachal government would also have to rethink its strategy. Industry Minister Mukesh Agnihotri said, "The department had been directed to study the incentives by the Punjab government. We are also framing the new industrial policy for Himachal Pradesh and the competition with the states would be taken into consideration while framing the new policy", he said. The surplus availability of power and peaceful atmosphere was the advantage for Himachal vis-a-vis Punjab. However, the state government would have to provide better infrastructure in the industrial areas. The high cost of land for setting up units was a disadvantage for Punjab. The cost of land though was lesser in Himachal, instead, availability of land was a problem. The land holdings were very small in Himachal and buying land from private buyers was a herculean task foran investor. In addition to that, the restrictions imposed under Section 118 of the Land Tenancy Act for diversion of agriculture land for other purpose delayed the procedures, he said. Mukesh Agnihotri said they would develop land banks to solve the problem. Earlier, panchayat pradhans used to approve the muster roles of workers. After following various procedures, cheques used to be issued to MGNREGA workers. Since the procedure involved a lot of paper work, the wages used to get delayed. The workers in the rural areas had to travel to cities to get the cheques cashed, he said. However, with the e-transfer scheme, the workers would be major beneficiaries. All muster rolls in villages had been digitised. The panchayat pradhans' e-signatures would approve the muster rolls on the computers provided in their offices. Abhishek Jain further said the project had been launched in the district with the help of the Union Ministry for Rural Development and Panchayats. The data regarding the e-governance of the MGNREGA scheme in Una district could also be secured from the website of the ministry, he said. With the implementation of e-governance of the MGNREGA scheme, officials in the district claimed that it would check corruption. They claimed that the manual system left certain scope for manipulations. However, since now the wages would be e-transferred into the accounts of labourers, it would minimise the chance of manipulations. Una is also among the three districts of Himachal where the subsidy of LPG cylinders was being transferred directly into the accounts of consumers. In January this year, the Health Department had deputed a radiologist from the Zonal Hospital, Dharamsala, here once a week on every Saturday as a stop-gap arrangement. The Rogi Kalyan Samiti (RKS) was paying Rs 2,000 for every visit of the radiologist. The patients started getting ultra-sound facility for just Rs 125 through the RKS. But suddenly the radiologist stopped visiting the hospital after April 6. Patients, especially expectant women, are facing a lot of hardship as they have to travel to Pathankot (Punjab) to undergo the prescribed ultra-sound tests in private laboratories which has been costing them very dear. DS Gurung, Chief Medical Officer, Kangra, said a radiologist had been deputed by rotation at the Civil Hospital, Nurpur, and he would enquire into the matter. Former local MLA Rakesh Pathania alleged that health services in the hospital were in a bad shape. But local legislature Ajay Mahajan held the previous BJP government responsible for the hospital's present state of affairs. To protect the state’s environment is the top priority of the Himachal Government. The state has made environment laws more stringent to deal with the situation. New environment guidelines have already been issued for power projects and cement plants coming up in the state. This was stated by Brij Behari Lal Butail, Speaker, HP Assembly, while addressing members of the Palampur Welfare and Environment Protection Forum, state government officers and elected representatives of panchayats and municipal council on the eve of the World Environment Day here today. He said Himachal Pradesh had emerged as the first state in the country to march towards achieving carbon neutrality. After going through various models of some environment-conscious countries like Costa Rica, the state government had drawn up a master-plan with the support of the World Bank for making Himachal Pradesh a complete carbon-neutral state. Butail said a bio-carbon project was under way in about 10,000 hectare of non-arable and degraded common forest land in the state. The focus of this project was only on a forestation for which farmers would receive cash incentives. The project aimed to develop cost-effective ways to minimise climate change risks by generating environment benefits through carbon regeneration, besides improving revenue generating capacity of small farmers. Butail said the state had also formulated a policy on climate changes to prepare a roadmap for issues to be focussed soon. The issues included introducing technological interventions for the reduction of greenhouse emissions from industries, residences, automobiles, landfills and agricultural sector. Under this project there was a plan for massive afforestation programmes, promoting use of renewable energy, encouraging the use of CFL bulbs, meeting energy requirements from hydel power, biomass rather than fossil fuels, recovery of energy from the waste and to prevent change in forest land use. No other party has fielded its candidate from this second largest Lok Sabha constituency in the country as the last date for filing nomination is June 5. Independent Subhash Anand, a resident of Nirmand Kullu, filed his nomination today. But none of the royals dominated the Mandi seat like Virbhadra Singh, the present scion of the Rampur Bushair state, who is well in command in the state for the record sixth time. He won the seat in 2009 and Pratibha Singh in 2004 for the Congress. The Congress sees Mandi as its bastion as the odds are heavily staked against the BJP this time. Virbhadra Singh dominated Mandi as he won it in 1971, 1980, and 2009, while Pratibha Singh won it in 2004. Sukh Ram won it thrice in 1984, '91 and 1996. The Congress lost four elections - 1977 in the anti-Emergency wave to the Janata Party and thrice to then BJP candidate Maheshwar Singh, the erstwhile royal from Kullu, in 1989, 1998 and 1999. The Congress is aiming the Mandi bypoll victory as a setting stage for the coming 2014 Lok Sabha elections, but the BJP was trying hard to give a befitting reply. The BJP staged its show of strength at Jai Ram Thakur’s nomination on June 1. Jai Ram Thakur has a clean image and organisational skills but the party has yet to match the Virbhadra Singh’s mass appeal. Second, it's best bet Maheshwar Singh parted ways with the BJP last year. He is opposing the BJP in this election under the banner of his Himachal Lokhit Party. He and Sukh Ram have aligned with Virbhadra Singh. Thirdly, Jai Ram Thakur was forced into the contest by his detractors on the ground that he was the strongest candidate the BJP has in Mandi. His campaign has yet to gain momentum as he is addressing party workers and corner meetings, while Virbhadra Singh has made roller-coaster ride in Kullu district and already covered three tribal segments, getting a huge response from both detractors and supporters, claimed party insiders. Briefing the Congress workers about the Mandi bypoll election strategy here today, Pathania praised the Congress party-led UPA government at the Centre for the inclusive development of the state and the nation and at the same time condemned the BJP government for selling out land and power projects to outsiders. Pathania predicted that the Congress candidate Pratibha Singh would win the Mandi byelection with a huge margin. Pathania said that the Congress government assumed office on December 25, 2012, and during this short stint, it had adopted its election manifesto as its policy document and already started implementing it. He stated that the Congress government had decided to provide Skill Development Allowance of Rs1,000 per month to the educated unemployed youth. As per the final figures available with the department, so far 7,477 applicants were supposed to appear for PET, but only 4,887 candidates appeared for the same and finally 1,191 candidates had been issued admit cards. These included 158 female candidates, roughly 13 per cent of the total. This was revealed Chief Conservator of Forests (CCF) ARM Reddy here today. The final ratio of candidates appearing for the written exam had now come down to 48 for one post, from the 300 candidates at the application stage. This was due to the tough standards maintained and the hard work of officials of the department deployed there in, roughly 9 hours a day, the CCF said. Reports said two policemen, Havildar Ved Prakash and constable Balbir Singh, were escorting the accused when he said he wanted to answer the call of nature. Both the policemen allowed him to go out in nearby fields at the Ghamani chowk. But when he did not return, they got suspicious and started a search for him. The accused was facing a trial for the murder of his elder brother Prem Lal of Doorghat village about two months ago. Both brothers had had a tiff when Prem alleged that Sanjiv was involved with his wife. Sanjiv had hit his brother on his head with a “danda” injuring him seriously, which later resulted in his death. The Superintendent of Police has suspended both the policemen and the police has started a manhunt for him. He has taken up the matter with the Chief Minister and the Industries Minister and suggested that the allowance, which was to be given only to those unemployed youth who had passed Class XII, should also be provided to matriculates. He said the qualification should be lowered as those taking admission into the skill development centres like the ITIs and polytechnics took admission after Class X. The Congress president also suggested that the age bar for the skill development allowance should be lowered to 18 years. Currently, it was for those who were between 25 and 35 years. By lowering the age bar, more people would be able to enjoy the benefits of entering into the ITIs and other skill development centres. Exercising his powers under Section 18 (10) (2) of the HP Hindu Public Religious Institutions and Charitable Endowments Act,1984, Deputy Commissioner Ajay Sharma, who is also the commissioner of this trust, has issued a notification appointing the SDM, Sadar, as chairman of the trust, Tehsildar Sadar member secretary and assistant engineers of HPPWD Sub-Division No. 2, IPH sub-division Sadar and HPSEB Bilaspur and Executive Officer, Nagar Parishad, Bilaspur, as official members of the trust. The non-official members are Dr Babu Ram Gauttam (ex-MLA), Indresh Sharma, Raman Anand, Rachhpal Singh member Nagar Parishad, Lok Nath, Narender Pandit, Dr RN Pillai, Nand Lal Rahi (retd teacher), Sanjay Saini, Sonika Sharma member Nagar Parishad, Onkar Kapil, Arjun Singh, Gopal Sharma and Jai Kumar. The party has pointed out that a half-page display advertisement was without any print line. The advertisement listing 23 achievements of the government also carried the pictures of Chief Minister Virbhadra Singh and Urban Development Minister Sudhir Sharma. Party spokesperson Ganesh Dutt urged the Chief Electoral Officer to take appropriate action against the violation. He said Congress candidate Pratibha Singh would bite the dust in the Mandi byelection. Addressing mediapersons here, he said the government had cheated people in the state. The Congress had promised to frame a policy for PTA teachers at its first Cabinet meeting, but it was not framed even after five months. It had promised unemployment allowance to the youth, but it had failed to give it. It had also promised to give a grade of 4-9-14 to employees from 2006, but now the government had said it would give it from 2012. He said the public had made up its mind and teach the Congress a lesson and Pratibha Singh, wife of the Chief Minister, would be defeated in the byelection. The convict, along with his accomplice Rajveer Singh from Madhya Pradesh, had taken Rs 80,000 in advance from each complainant, Ran Singh of Haler, Karam Veer of Sanor, Vikram Singh of Mand-Sanor in Indora tehsil and Randhir Singh of Dinanagar (Punjab), in 2004 and promised them jobs in the Army. After waiting for about one year, the victims had registered a cheating case under Section 420, IPC, with the Indora police on April 30, 2005. According to Assistant District Attorney Vijay Rihaliya, the case was put in the court for prosecution on July 30, 2005. He said co-accused Rajveer Singh had absconded and the court had declared him a proclaimed offender. District Attorney Mahesh Sen said the case pertained to August 1, 2009. The complainant, who had purchased a plot of 4 bighas, applied to the TCP Department for approval to enable him to carve out plots and sell these. The draftsman had then demanded a bribe of Rs 5,000 to clear his file. The complainant then had informed the Vigilance and the Anti-Corruption Bureau and he was nabbed red-handed while accepting the bribe.